After driving roughly nine hours over the last few days I came up with a business idea that is free for the taking. 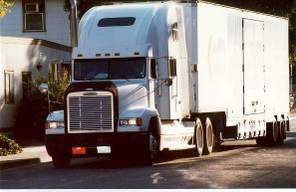 In my highway driving experience, I’ve noticed that about 30 to 40 percent of the trailer parts of semis go unbranded. This is where the opportunity lies. The Idea: Rather than putting the trucking company’s logo on the trailer, the company should up-sell a banner or magnet advertisement to the company whose products it is hauling. This would give marketers an additional venue for advertising and allow trucking companies an opportunity to increase revenues. The Catch: One major drawback of this idea would be that companies that pay to advertise might receive negative attention if a semi was responsible for an accident.